The Poland’s flag carrier on January 1 started flying directly from Warsaw to London-City (LCY) up to twice a day. From February 18 the company will also operate to London-City (LCY) from Budapest and starting as of May 1 from Vilnius. Flights from Warsaw Airport (WAW) to London-City Airport (LCY) will be operated according to the following schedule: Departures to LCY daily (except Sundays) at 7:15am, arrivals at 9:00am and daily (except Saturdays) at 4:15pm, arrivals at 6:00pm. Departures to WAW are scheduled daily (except Sundays) at 9:30am, arrivals at 1:00pm and daily (except Saturdays) at 6:30pm, arrivals at 10:00pm. As many as 7 million passengers travelled between Poland and UK in 2017. The schedule will be in favour of business passengers flying to London-City from Warsaw as well as the other cities in the region such as Vilnius, Kiev, Lviv, Riga, Bucharest, Larnaca or Tbilisi. From now on, they will be able to complete their journey within one working day. 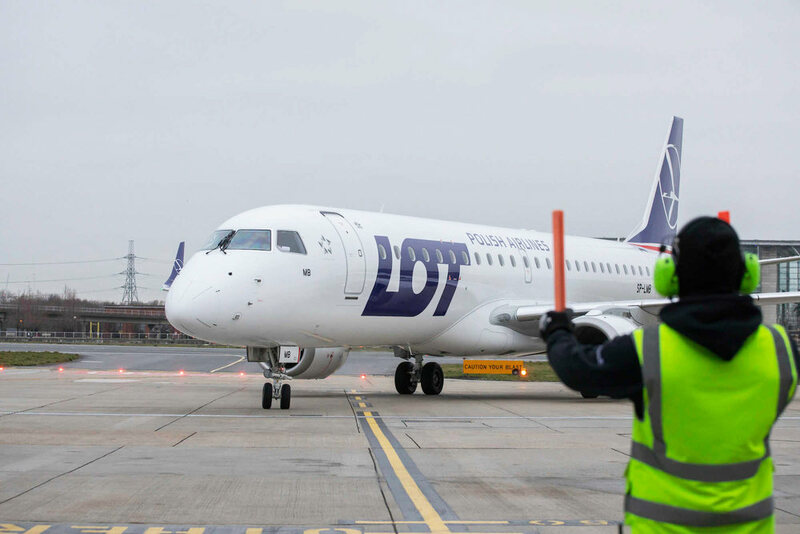 In order to operate to London City, LOT has decided to acquire brand 4 new Embraer E-190 jets, which are compatible with the shorter runway at London City. The airplanes were delivered to LOT by the end of 2018 directly from the Embraer factory in Brazil. The new Embraer E-190s have a ​capacity of 106 comfortable seats in three class of travel (business, premium economy and economy class), which gives an efficient combination of optimum range and maximum number of passengers.